High Quality Linear Actuators for Electric Couches & Operating Tables | Venture Mfg Co.
With an increasing number of patients and long working hours, the healthcare sector is looking for ways to improve the working conditions of healthcare staffs. To provide the best treatment, doctors and healthcare staff need to be fit and healthy. This is only possible when they have access to ergonomically designed furniture, accessories, or equipment. Adjustable electrical couches and tables are one of those advanced medical applications, which are designed keeping the comfort of healthcare staff in mind. These electric couches and tables are fitted with linear and electric actuators that allow hospital staff easy adjustments as per their comfort. Venture Mfg. Co. provides quality actuators that ease movements and functions in these electric couches and tables. Venture Mfg. 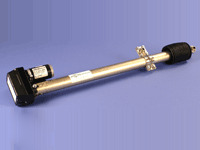 Co. supplies high quality actuator solutions to medical equipment manufacturers. We provide a brilliant selection of innovative linear actuators for operating tables, and electric motor actuators for couches. 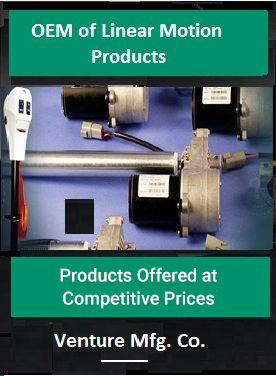 Our actuator systems can be customized to meet your requirements. In this way, we can help you improve the performance of your medical care products. Our actuators aid in easy height adjustments, and allow for repositioning of couch, or table sections at different angles. Simple Designs: Our linear and electrical actuators have easy-to-install designs. These actuators provide savings in terms of compact designs, less maintenance, high reliability, and easy repairs. Also, our electric actuators can maintain loads, even without continuous power supply, so they are less expensive and easier to operate. Small Footprint: We employ advanced technologies to build innovative actuator systems with a small footprint. These actuators have a smaller number of components. This optimized design provides more flexibility in terms of application. Simple Assembly: Our actuators can be easily connected with wires and cables. This simple assembly process helps save time, labor costs, and improves equipment performance. Supports Advanced Features: Our electrical linear actuators can be integrated with programmable controllers that control various operations in advanced electrical couches and tables. Silent Operation: Our electric linear actuators and electric actuators are controlled by quiet electrical motors, which makes them suitable for various medical applications such as home care beds, hospital beds, etc. Safe: As the name suggests, our electric linear actuators are powered by electricity, which eliminates the risk of leaks and contaminations, and improves the overall experience of users and hospital workers. If you are a medical equipment manufacturer, then we can provide right actuator systems for your requirements.